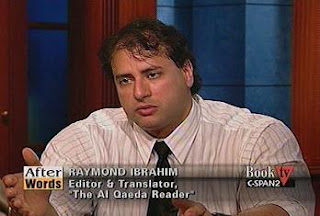 Raymond Ibrahim was interviewed about the book he edited and translated, The Al Qaeda Reader, published by Broadway. He translated key al Qaeda documents, some previously unavailable in English, that provide a window into the thinking of radical Islam's leadership. The book contains both theology and propaganda, focusing on the writings of Ayman al-Zawahiri and Osama bin Laden. The guest interviewer was Lawrence Wright, winner of the 2007 Pulitzer Prize in general non-fiction for his book The Looming Tower: Al-Qaeda and the Road to 9/11, published by Knopf. Raymond Ibrahim is an historian of the Middle East and Islam. He works in the Near East section of the African and Middle Eastern division of the Library of Congress, where he discovered many of the never-before-translated Arabic texts that make up the bulk of The Al-Qaeda Reader.